The nanny resume example below is for an experienced educator with complimentary experience. This individual wanted to become an educator transitioning her childcare, customer service, and soft skills experience. The summary showcases the job seeker’s teaching, reading, mathematics, and bilingual skills. The “Professional Highlights” section contains keywords appropriate to her experience for brand marketing. Immediately following, is a recount of her professional experience starting with her current role including important responsibilities. 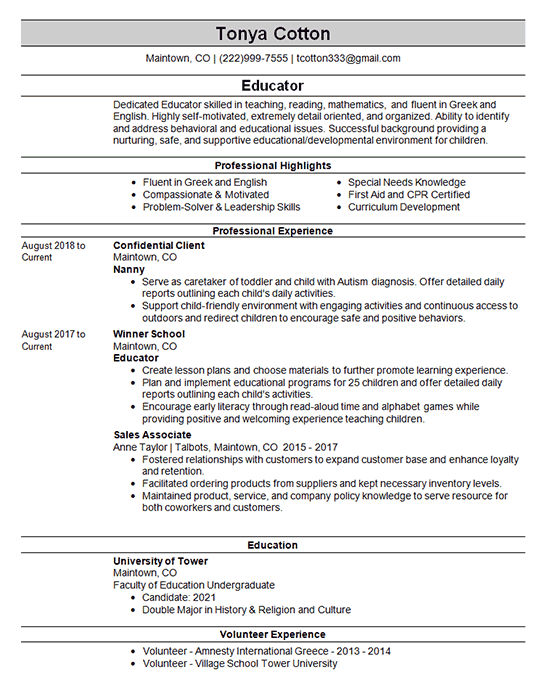 The resume closes with her education and volunteer experience. Dedicated Educator skilled in teaching, reading, mathematics, and fluent in Greek and English. Highly self-motivated, extremely detail oriented, and organized. Ability to identify and address behavioral and educational issues. Successful background providing a nurturing, safe, and supportive educational/developmental environment for children. Serve as caretaker of toddler and child with Autism. Offer detailed daily reports outlining each child’s daily activities. Support child-friendly environment with engaging activities and continuous access to outdoors and redirect children to encourage safe and positive behaviors. Create lesson plans and choose materials to further promote learning experience. Plan and implement educational programs for 25 children and offer detailed daily reports outlining each child’s activities. Encourage early literacy through read-aloud time and alphabet games while providing positive and welcoming experience teaching children.